Benjamin Netanyahu’s hiring of YouTube "sensation" Hananya Naftali as his new deputy social media adviser is disgraceful. 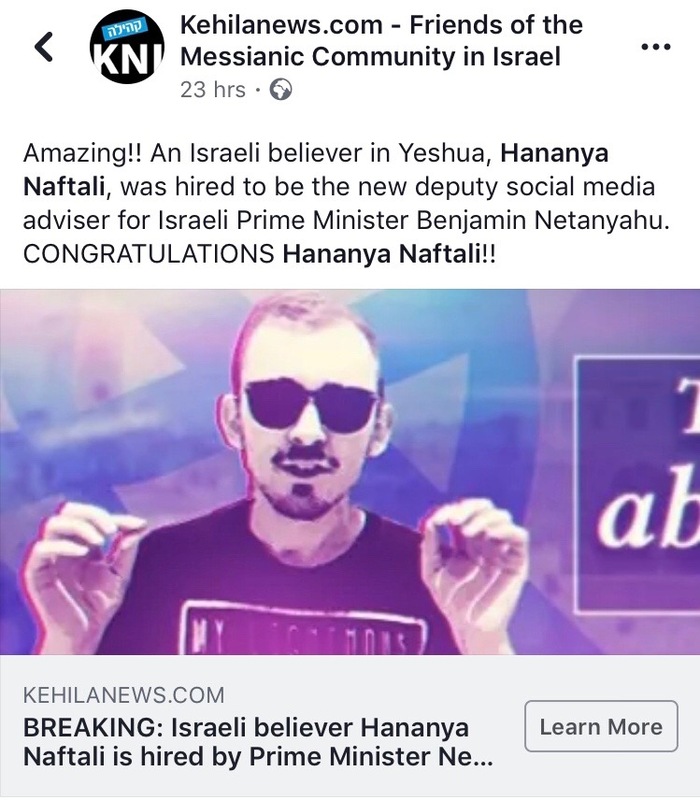 As a notorious online missionary, Hananya Naftali's brazen admissions of proselytizing while in the IDF are well known. This disgraceful act from Bibi proves once again, that even in an era of anti-Torah values where anything seems possible, there are always lower levels of chillul Hashem that a society can succumb to. It exposes how far Israel's leadership has fallen. This is well beyond the challenges of secularism as it relates to a Jewish society, albeit one that very far from a Torah society. This speaks of basic Jewish identity and self-respect, so necessary for us to survive as a religio-nation. In short, when a spiritual predator of Jews whose proselytizing efforts are documented on video, can nevertheless be hired by a prime minister of Israel, something is indeed very wrong with the Jewish psyche. This is what happens after years of sleeping with evangelicals. Sleeping with the enemy is bad enough when it's just a one night stand. 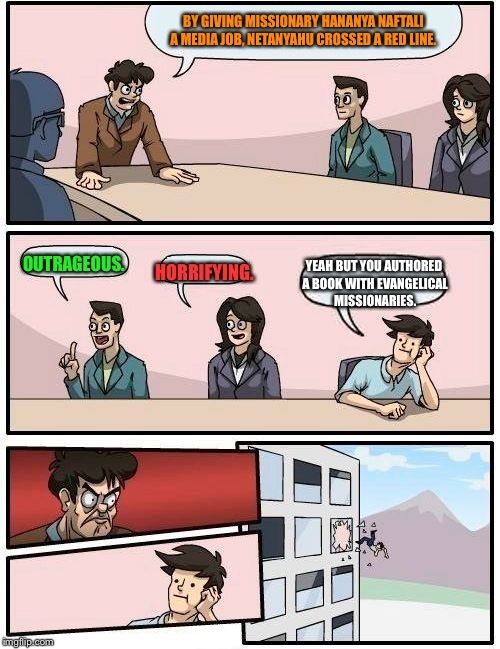 The torrid love affair with evangelicals is an enduring one. Contrary to what too many brain-addled daati-leumi types think, evangelical money doesn't come free. The cost is high: a growing missionary presence in Israel that is more sophisticated, ambitious, and powerful than it was even five years ago. Thanks to Jewish collaboration. The reaction from the enemy is nauseating. Gloating and celebration. 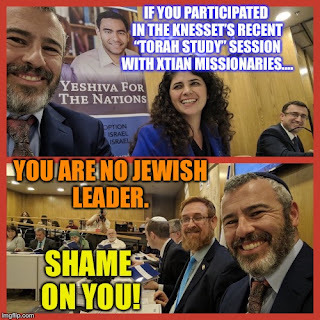 The messianics and missionaries (in Israel and abroad) are celebrating because they know that missionaries are normalized in Israeli society and by the Israeli government. They understand that not only is Hananya Naftali no longer viewed as toxic, he is seen as a friend and an advocate for Israel. If in the past, Israel's anti-missionary laws were weak and ineffectual, they are entirely impotent today. Once upon a time, decent traditional secular Israelis would have wept. 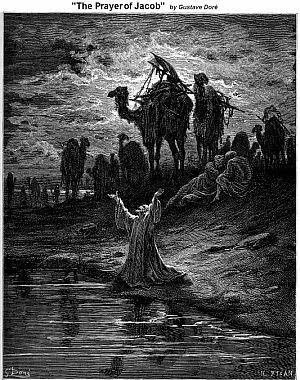 Today, more than a few religious Jews couldn't care less. Some are even glad. In the aftermath of this perversion, certain voices rose up in outrage. Outrage is correct and understandable. But when did they wake up? And have they really? As I noted, the Likud has been in bed with missionaries for years. So it was inevitable that a friendly online missionary would become mainstreamed in an age of mindless, blathering, pandering, hasbara. Why not? Naftali “defends” Israel on YouTube. This is the end-goal, so why should hasbarites be surprised. Yet the chutzpa of certain voices is beyond the pale.Some of the voices of outrage come with those who collaborate & collude with evangelicals. From the kinds of people who write books with missionaries, engage and dialogue with them, and even have tanach sessions in Knesset. Consider Rivka Adler Lambert and her "Ten For The Nations" book, which has chapters written by missionaries. She had the nerve to recently open her mouth on Facebook about Naftali. Shortly afterwards, she deleted the post when some of us "hijacked" her wall (the precise word used by an anti-missionary activist who disliked our aggressive approach) and demanded accountability from her. As these respectable types see it, Lambert should be praised. I believe that it is a clever diversion by a guilty party who is trying to sanitize her credentials from odious associations. Similarly, Zehut's Moshe Feiglin has no credibility when he opines on Naftali yet ignores Zehut's Yishai Fleisher's enduring friendship with Hayovel missionaries, and his regular participation in the Knesset's tanach sessions with evangelical soul-snatchers. 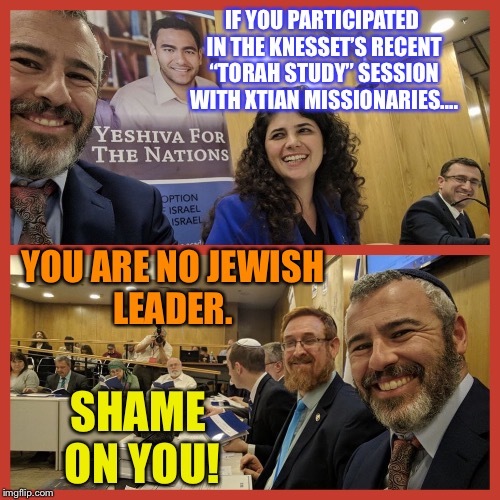 Such Torah sessions are well beyond the pale of anything acceptable in Torah society, and as such they are a clear violation of Rav Soloveitchik's strong position against any form of interfaith dialogue as expressed in his classic essay, "Confrontation". I am still waiting for JewishIsrael to explore Feiglin's failure to address this troubling issue. After all, JewishIsrael has written extensively on these issues in the past. Take the hasbara blog Israellycool as another example. They celebrated Hananya Naftali until they could not. But even then, they gave him a slap on the wrist and refused to really tear into him. They attacked me relentlessly for calling out their soft handed approach. They never mentioned that "The Israel Project" still uses him, or gave it to "StandWithUs" for merely scrubbing him from their system. That would be hasbara suicide. The "Elder of Zion" blog had him listed for their coveted "hasby awards" in 2017. 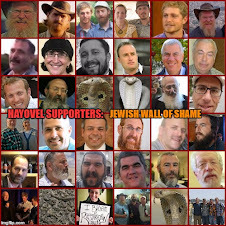 In the interest of complete candor, they recently published Varda Epstein's article against Hananya Naftali. Although it was a flawed effort which neglected many of the more difficult questions, it is nevertheless interesting that it wasn't featured on Israellycool, where her past articles were given a forum. 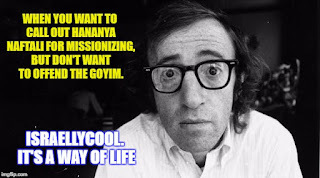 My understanding is that Israellycool is now reticent to address Hananya Naftali, further proving my point that they have no spine or integrity. They get angry at me for my past assertions regarding their craven platform, and they then confirm my arguments. I am no mind-reader, but they are as predictable as the sunrise. Their mindset is clear. If it is good enough for the Prime Minister of Israel, what is any self-respecting hasbarite to do? Fight the PM and call him out? This would be a shanda for the goyim! And even were Israellycool to go after Naftali they have a dilemma. 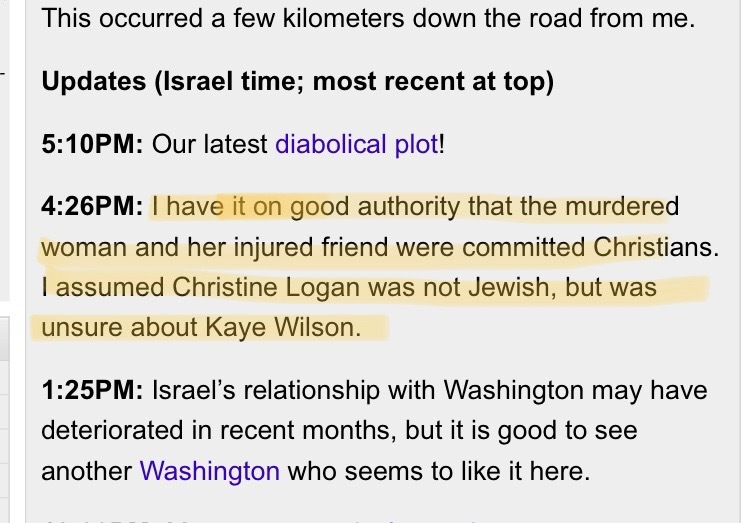 What kind of credibility can they have, when they still ignore their own contributor Kay Wilson’s documented messianic past which she has never admitted. They will scream slander in the face of unread, ignored, evidence, yet once upon a time they made an interesting claim themselves. At the time of the incident, when she was unknown and they had no relationship with her, they were eager to get the scoop, and the following comment was posted on their blog. I bet they wished they hadn't been so ambitious. 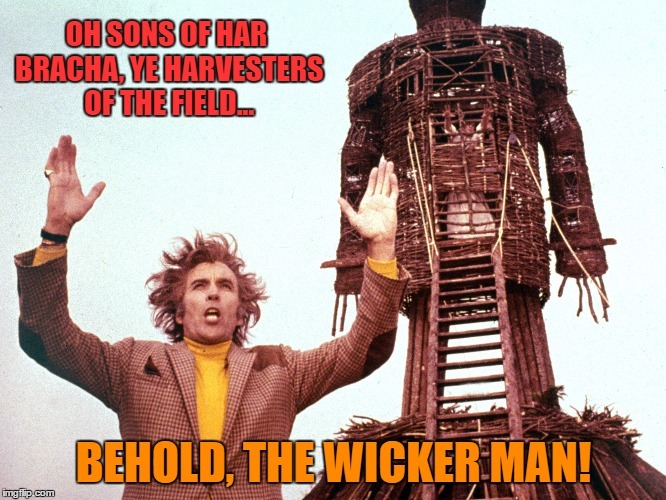 And what of the so-called experts who defend a Kay Wilson while touting their so-called credentials and ignore the naked facts of an unrepentant former(?) messianic?Self-proclaimed expert, Penina Taylor comes to mind. Personally, I have no patience for such disingenuous behavior. 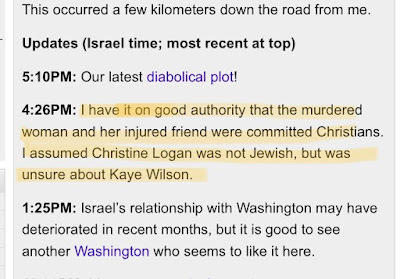 Ms. Taylor might benefit from further investigation into Kay Wilson, starting with JewishIsrael's article "Will The Real Kishkush Stand Up?" 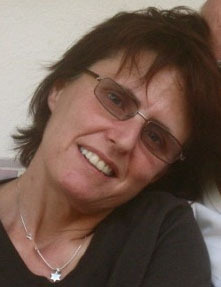 To date, Penina Taylor has never presented a public refutation of the article's contents. As I see it, her sanctimonious assurances of having "vetted" Kay (as articulated in her Times of Israel article, "The Witch Hunt") are devoid of any credibility, if she cannot answer questions. Tragically, certain individuals and organizations today who previously fought these issues, were bullied into submission over the years. Some of them are reticent to address these troublesome issues. Some pop up from time to time to offer their expertise. More than a few nakedly pander to the same forums and personalities who bashed them yesterday. (We have screenshots.) My advice to these weathered veterans. Call them all out, or shut your mouths and go away. Or do what the mainstream hasbara forums do and blog about celebrities and the BDS movement. But don’t lecture the few who are consistent and unafraid to demand equal accountability from everyone. It is normal to be broken by bullies, and to lose resolve. It is a tragic, but normal human reaction in the face of unrelenting bullying. If this is the case, retire gracefully and go away. Because one responds to bullies by punching their lights out, not by appeasement. I want to reiterate that’s Hananya's hiring is indeed an outrage and the kind of thing that should destroy a coalition (were there principled traditional/religious Jews in Bibi's coalition). Every day, the chillul HaShem grows stronger, and because he can, Bibi will continue to do what he wants. A simple and attainable goal would be to demand Naftali's firing. It will require extraordinary muscle, and I fear that at this point the collective Jewish voice is atrophied. In truth, the only voices that can argue such a position in good conscience are those whose conscience is clear. Not from those shtetl syndrome types who grovel before goyim and seek arrogant token gentiles to "defend" them with un-Jewish arguments. And not from those timid "hasbarites" who pine for popular attention and yearn for those coveted "hasby" awards.